What is the current 510k pathway for clearance of medical devices? Is the predicate device legally marketed? Do the devices have the same intended use? Do the devices have the same technological characteristics? Do the different technological characteristics raise different questions of safety and effectiveness? Are the methods of evaluating new/different characteristics acceptable? Does the data demonstrate substantial equivalence? You may have been complaining that 510k requirements seem to change constantly. Now you have proof that the changes to the 510k pathway are part of a strategic plan implemented over the past decade. Lawyers may argue that the resulting regulations go well beyond the intent of the original 510k legislation. This is completely true. The cumulative effect of implementing dozens of 510k guidance documents is that the official interpretation of the 510k section of the Food and Drug Act now has little resemblance to the original legal intent. What is basis for the Alternate 510k Pathway? The basis for the alternate 510k pathway is submission of data that is safety and performance based instead of comparison to an older predicate. In addition, the new pathway will enable you to make comparative claims by demonstrating that the new subject device meets or exceeds the safety and performance criteria. There is also a goal to use the pathway as a potential method of harmonizing the US medical device regulatory process with other global medical device regulations. The new process, combined with improved post-market surveillance, will complement the FDA’s work on NEST by allowing the FDA to rapidly require implementation of risk controls to address identified safety issues. What is the expected timeline for implementation of the Alternate 510k Pathway? The alternate 510k pathway has been in development for quite some time. Jeff Shuren first announced the plan to create the alternate 510k pathway at AdvaMed’s MedTech conference in San Jose, California in September 2017. On Monday, December 11, 2017, the FDA announced that a draft guidance would be released in Q1 of 2018. On April 12, 2018 the FDA finally released the draft guidance for public comment. The FDA intends to release a final guidance for the new alternate 510k pathway in early 2019. This pathway will initially be limited to “well-understood device types”–probably as a 510k pilot program. You can expect this new pathway to be released in a similar way to the Special 510k expansion pilot and the Quik 510k pilot. That final guidance will be released, and the pilot will begin immediately after release of the guidance. Is this new process likely to require significant changes to future 510k submissions? The phrase “significant changes” is subjective, but if you look at the current 20 required sections of a 510(k) submission, there is only one section that would be required to change for the new alternate 510k pathway. Specifically, section 12 is currently used for a substantial equivalence comparison. This section would not be applicable under the alternate 510k pathway. Under the alternate 510k pathway, you can expect the FDA to require at least a summary of the safety and performance data to be submitted for approval of the subject device. Another change you can expect is that all devices submitted under the alternate 510k pathway will be required to have a benefit-risk analysis in accordance with the corresponding FDA guidance. This new guidance was released on September 25, 2018 as a draft. However, a benefit-risk analysis is required for De Novo applications, CE Marking applications and it is logical that the FDA will also require this for 510k submissions that do not rely upon equivalence to predicate device. The FDA also indicated that a new guidance for De Novo applications will be released in a couple of weeks. Please subscribe to our blog, and you will receive notification of a blog in response to that guidance when it is released. There are 38 product classification codes that the FDA selected for the Quik 510k Pilot program to evaluate version 3 of the eSubmitter software. What are the three (3) advantages of the new Quik 510k pilot program? There are three (3) advantages of using the eSubmitter software as part of the Quik 510k pilot. The first advantage of using the eSubmitter software is that the refusal to accept (RTA) process will be eliminated. This change is huge, because nearly 50% of submissions are rejected during the RTA screening process. The hope is that the eSubmitter software will prevent companies from submitting submissions that are missing required content, and therefore the RTA process will not be needed. However, we have seen many submissions placed on hold for technicalities rather than sub-standard submissions. Therefore, it will be fascinating to see the FDA reported outcomes from the Quik 510k pilot. The second advantage of using the eSubmitter software is that the reviews will be interactive. This means that reviewers are not expected to have any additional information (AI) requests. This also means that submitters will need to respond to questions from reviewers quickly. For example, I have received a call on Friday afternoon after 5:00pm EDT asking if I could make a revision to document and email that document to the reviewer by Monday morning. This is an extreme example, but 48-72 hours is typical for a required turn-around during interactive reviews. The third advantage of using the eSubmitter software is that the FDA is targeting completion of their 510k review within 60 days. This 30-day reduction may seem huge, but the FDA already cut 15 days off their review timeline by eliminating the RTA screening. Second, the FDA picked 38 product classification codes that should not have difficulty reviewing in 60 days. Not all product classifications have the same amount of testing data required, and I do not expect the FDA to be able to review all product classification codes in 60 days–even with eSubmitter. Although the Quik 510k pilot mentioned that submissions would be zipped, eSubmitter is also designed for electronic submissions through an electronic submissions gateway (ESG). An ESG has the added advantage that you will not need to ship your submission via FedEx. This advantage will gain you only a maximum of 24 hours, but I wish I had those 24 hours last week. Every year, in the last week of September, all the small businesses with small business qualification try to submit their 510k prior to end of the fiscal year (i.e., September 30). This year I had four clients that were in this position. One was unable to get the data they needed to complete their submission prior to September 30. The other three were making last minute changes up until the afternoon of Thursday, September 27. One of those submissions was extremely challenging, because the submission included video files that exceeded 1GB in total. Therefore, I called CDRH’s eCopy Program Coordinators at 240-402-3717. They were extremely helpful. They said that it would be best to provide two identical eCopies, or to save the MISC FILES and STATISTICAL DATA folders on a separate flash drive. The reason for this is that very large submissions can take days to upload into the CDRH database. Therefore, the picture below shows you what my final solution was for the three submissions this week. The De Novo submission had to be split. If you have a product with any of the 38 product classification codes listed above, and you need to submit a 510k in the next 6 months, you are very fortunate. Your submission will be prioritized by the FDA and you are likely to be able to get your device cleared in 60 days or less. Our firm is very anxious to take part in this pilot because the FDA intends to require the eSubmitter software for all submissions in the future, and we expect other product classification codes to be added to the pilot over time. We process dozens of 510k submissions each year and mastering the nuances of the software is critical to our continued success. I already downloaded the software and installed it onto my computer. I also created a complete submission as a test. eSubmitter saved several hours in the preparation of a 510(k) from the typical 40 hours the process takes. Therefore, I expect implementation of new eSubmitter software to a triple win for the FDA, clients and our firm. In fact, I plan to request that the FDA add De Novo submissions next to this pilot. The reason is that De Novo submissions typically have more content and the content is more variable. I think this would be an extremely challenging test for eSubmitter, and the relatively small volume of De Novo submissions would limit the impact upon FDA resources. In 2017, the FDA indicated that eSubmitter software was going to be revised and it would be approximately 2 years before companies would be able to submit a 510k electronically to the FDA. Until then, companies must ship an electronic eCopy and a paper copy to the FDA Document Control Center (DCC). The eCopy guidance states, “An eCopy is accompanied by a paper copy of the signed cover letter and the complete paper submission.” However, the FDA’s eCopy guidance has not been updated since December 3, 2015. There are some unofficial changes to the policy, and the FDA no longer requires the complete paper submission. Instead, you can submit an eCopy accompanied by a paper copy of the signed cover letter. Before February 2018, we would print 1,000+ pages for each 510k submission, pack two 3” three-ring binders in 12”x12”x6” ULine boxes and ship the box to the FDA overnight via FedEx. We typically would charge $400 for this eCopy service. After the unofficial policy change, all of our 510k submissions consist of a paper copy of the cover letter and an eCopy on a USB flash drive. We only charge $150 for the FDA eCopy service, and 100% of our eCopy submissions have been uploaded without problems this year. What is the difference between creating an eCopy and submitting with eSubmitter (cited from FDA website)? An eSubmission package contains PDF attachments and XML file types. The XML files are intended for CDRH IT systems to process the application. Reviewers will not see these XML files. The parts of the eCopy guidance that describe the structure of a 510(k) submission will not apply to the Quik Review Program Pilot. An eSubmission is organized according to the layout of the template, which places administrative documents (e.g., Form 3674, the 510(k) Summary, the Truthful and Accurate statement) at the end of the submission because their applicability is determined based on the answers to questions in the body of the template (e.g., Form 3674 is only required if the applicant indicates clinical data are included). Electronic signatures are used in the submission (e.g., on the Truthful and Accurate statement), rather than physical signatures. Template Version 1.3, for In Vitro Diagnostic 510k submissions to CDRH only, allows you to create a 510k submission and the eSubmitter software will package your submission in a specially formatted zip folder that you can save to a compact disc (CD), digital video disc (DVD) or flash drive. Then the you must print a paper copy of your signed cover letter and ship the eCopy created by eSubmitter with your paper copy of the cover letter to the FDA DCC. Template Version 1.2.1, for Non-In Vitro Diagnostic 510k submissions that are among the 1,000+ other product classifications not included in the Quik 510k pilot (CDRH: Medical Device eCopies), you can create a 510k submission and the eSubmitter software will package your submission in a folder for you. You can then copy the contents of that folder to a compact disc (CD), digital video disc (DVD) or flash drive. Then the you must print a paper copy of your signed cover letter and ship the eCopy created by eSubmitter with your paper copy of the cover letter to the FDA DCC. When you create your own eCopy, then you will need to create a volume based or non-volume based submission in accordance with the eCopy guidance. The volume folders and/or files are saved to a compact disc (CD), digital video disc (DVD) or flash drive. Then the you must print a paper copy of your signed cover letter and ship the eCopy you created with your paper copy of the cover letter to the FDA DCC. Warning: If you are using Windows 10, and you save your eCopy or eSubmitter zip folder on a flash drive, Windows 10 will automatically create a hidden system folder titled “System Information Volume.” This folder is created as a security feature to enable you to recover accidentally deleted content. However, this folder results in an error when the FDA attempts to upload your submission automatically. Therefore, you must remove this hidden system folder. Instructions for this can be found on our website page about eCopy hidden system files. Third party review of 510(k) submissions – When it makes sense and which third party to choose? A third party review is the review of a 510(k) that has been submitted directly to a third party rather than the FDA themselves. Back in 1997 as part of the FDA Modernization Act or FDAMA the ‘Accredited Persons Program’ was created. This allowed the FDA to accredit persons, or ‘third parties’ to conduct the primary review of certain 510(k) submissions. One of the goals of this program was to be able to make the submission and review process faster and more efficient. The third party review is not a full alternative to submitting a 510(k) to the FDA. Third parties are authorized by the FDA to conduct the primary review of specific types of devices only. Only certain devices are eligible for third party review. The FDA keeps a database of those devices here in one of their medical devices databases (http://www.accessdata.fda.gov/scripts/cdrh/cfdocs/cfThirdParty/current.cfm). The use of a third party review also does not bypass the FDA. The third party is only conducting the primary review of the 510(k) and then forwarding the submission, the review of the submission and the post review recomendation to the FDA. The FDA then has a 30 day timeline to issue a final determination of the submission. How many 510(k) submissions use a third party review? In 2016, I did an analysis of 510(k) submissions reviewed by the general and plastic surgery panel. I reviewed submissions that received clearance between January 1, 2015 and August 10, 2016. Of the 690 510(k) clearances that were issued by the panel, only nine (9) were submitted for third party review. Although third party reviewers were responsible for only 1.3% of the submissions I reviewed, there are other device classifications with higher percentages of reviews being conducted by third party reviewers. In fact, there were a total of 114 submissions that were issued 510(k) clearance through a third party review process during that period. For this article, I reviewed the 3,023 510(k) clearances that were issued in the past 12 months (i.e., May 23, 2016 through May 23, 2017). Only 75 of the 510(k) submissions issued (2.5%) were submitted for third party review. Of these 75 submissions, the average review time by the FDA (after the third party review is completed) was 46 days. Since the average review time for the FDA of a traditional 510(k) is 183 days (based upon my data analysis from 2016), third party review can potentially reduce your 510(k) clearance timeline by months. Why do only 2.5% of 510(k) submitters utilize a third party review? Originally, my theory was that only a limited number product classification codes are eligible for third party review. The FDA is trying to expand the third party review program, but 44% of third party reviews are for the radiology panel. Another 13% were for the general hospital panel, and 13% more of the reviews were for the cardiovascular panel. Finally, less than 7% were reviewed for the dental panel. The remaining 17 submissions were reviewed for other panels. A closer look at the product classification codes shows that there are only a few product codes within these panels that are being reviewed by third parties. The FDA keeps an up to list of approved third party reviewers under the Medical Devices Databases. Titled Current List of Accredited Persons for 510(k) Review under the FDA Modernization Act of 1997- (http://www.accessdata.fda.gov/scripts/cdrh/cfdocs/cfthirdparty/Accredit.CFM?party_key=8). As of Quarter Three there have been a total of 53 Third Party 510(k) Submissions Accepted. A majority of these completed by Regulatory Technology Services, LLC, and Third Party Review Group, LLC (TPRG). 36, and 13 respectively. All of the others have 5 or less but these numbers may increase once the fourth quarter report is released. When should you chose a third party review instead of submitting directly to the FDA? Always check the 510(k) database to see if third party reviewers were used for your product’s classification code. Ideally, a third party reviewer has been involved in a device that is in the same product classification and possibly that device would be a suitable predicate for you to select for your 510(k) submission. If your search yields no results, your device may not be eligible for a third party review. However, you can always contact one of the four third party reviewers listed above. In general, the third party review process is an excellent way to shorten your 510(k) clearance timeline by months. The cost is significantly more than the FDA user fee. However, faster time to market is almost always worth the increased fee. Therefore, if a third party review is available I recommend taking advantage of this option. Medical Device Academy offers a regulatory pathway analysis service for $1,500. For those of you that are only interested in the US market, rather than including the EU and Canada, the cost for this service is only $750. Do you need help identifying the product classification for your device, determining the required performance testing and selecting a predicate device? We can do this for you in one week or less. Do you need an expedited review? We can also determine if your product is eligible for third party review and obtain a quote for you. Are 510k pre-sub meetings a waste of time? This article reviews four of the top reasons for why other companies feel requesting 510k pre-sub meetings is a waste of time, but you can’t afford to. If you are less than a week away from submitting a 510k, it is too late for requesting 510k pre-sub meetings. The FDA target for scheduling a 510k pre-sub meeting is 60-75 days from the date your request was submitted. That’s 10-11 weeks. Most companies tell me that they plan to submit a 510k within weeks or a couple of months, but most of the companies take several months and frequently there is a delay that requires 6 months or more. For example, what if your device fails EMC testing, and you have to change the design and retest for both EMC and electrical safety? At best you will have an 8-week delay. If you submit request next week, and everything goes as you plan, you can always withdraw your request for the pre-sub. If you encounter a delay for any reason, suddenly it’s not too late. I believe that waiting until your design is almost complete is the number one reason why companies wait too long to request 510k pre-sub meetings. If they wait too long, then the previous reason for not requesting a meeting takes over. The ideal time to submit a pre-sub request is 75 days before you approve your design outputs (i.e., design freeze). However, very few people are that precise in their design planning and execution. You should try to target sometime after you approve your design inputs, but before you approve your design outputs. As long as you submit an update to your pre-sub request 2 weeks before the meeting, the FDA will accept it. Also, you can always schedule a date that is later than 75 days if you realize you requested the meeting too early. 510k pre-sub meetings are “non-binding.” That means that the FDA can change their mind, but it also means you don’t have to do everything the FDA says in a 510k pre-sub meeting. If you don’t ask a question about testing requirements, that doesn’t mean that the FDA does not have any testing requirements. The FDA knows what previous companies have submitted for testing better than you do, and they may be in the process of evaluating a draft special controls guidance. If you ask questions, you will have better insights into what the FDA expects. Understanding FDA expectations helps you write better rationales for testing or test avoidance. You also might learn about deadlines for implementation of new testing requirements that you might be able to avoid. Finally, you can ask the FDA about possible testing options you are considering if your most optimistic testing plans are denied by the FDA. Not all device classifications have a guidance document explaining what information should be submitted in a pre-market 510k submission. However, there almost one hundred Class II Special Controls Guidance Documents. Therefore, there is a good chance that the FDA published special controls as part of the regulation for your device or as a guidance document. As part of the special controls, the FDA defines what performance testing is required for your device. If you already know what testing is required, then the value in requesting 510k pre-sub meetings is diminished. But at least three other key benefits remain. First, you can verify that the predicate you plan to use for comparative testing is not going to be a problem. Although, the FDA can’t tell you which predicate to pick, the FDA can tell you if there is a problem with the predicate you have selected. This is especially important if the product is not currently registered and listed, because you may not know if the device was withdrawn from the market after it was cleared. Second, not all testing standards are prescriptive. Many tests, have testing options that require you to make a decision. Input from the FDA may be valuable in making choices between various performance testing options Sometimes you even forgo testing and provide a rationale instead. FDA feedback on any rationale for not doing testing is critical to prevent delays and requests for additional information later. Third, there are many different FDA representatives that participate in 510k pre-sub meetings. The lead reviewer will invite specialists and the branch chief to the meeting. Each of these specialists can answer questions during a pre-submission meeting that they are not able to answer during the actual review process. You also have the opportunity to get feedback from the branch chief–who has insight from all the previous devices that were cleared with your product classification. Your lead reviewer is not likely to be as experienced as the branch chief, and may only have been working at the FDA for months. Your request for the 510k pre-sub meeting will help an inexperienced lead reviewer as much as it will help your company. On Thursday, February 22 there will be a free webinar offered on the topic of 510k pre-sub meetings. We had 50 people register for the webinar in the first day it was announced, and we have already answered more than a dozen related questions. If you are planning to submit a 510k this year, this webinar will show you exactly how to prepare your own request for a 510k pre-sub. You will even receive copies of all of our templates for free. The following is a copy of my responses to someone that submitted biocompatibility testing questions in preparation for the 510k pre-submission webinar that I am hosting Thursday, February 22 @ 4pm EST. Can you please answer the following biocompatibility testing questions? This was the request by a person that registered for my live webinar next Thursday. The person asked some great questions that are very similar to other clients I work with. They also asked the biocompatibility testing questions in a way that did not divulge any confidential information–other than to indicate they live in Germany. Therefore, I am sharing my email response with you. Please register for this webinar and submit your own questions. Questions are entered in an open text box, and you have room to ask multiple questions. 1. Does the FDA now already ask for the AET (Analytical evaluation threshold) for chemical analyses? Nelson Labs is offering a 1-day seminar the day before the 510(k) workshop on biocompatibility ($499): http://news.nelsonlabs.com/education/events/biocompatibility-testing-for-medical-devices-seminar. 2. How can I avoid time consuming genotox studies for FDA? Typically if you perform the “Big 3” (i.e., cytotox, irritation and sensitization), and then you perform chemical characterization, you are often able to prepare a Biological Evaluation Report to explain why there are no identified compounds in the chemical characterization that would warrant performing the genotox studies. This is also often true for the acute toxicity testing and sub-chronic toxicity testing. In order to verify the FDA will accept this approach, you will typically provide a biological evaluation plan (BEP) as part of your pre-submission request. This often saves > $10K. 3. And how can I face FDA with a cytotoxic wound dressing but which passed irritation, sensitization, genotox and pyrogenicity tests? I had a product that contained aluminum. Aluminum is cytotoxic to the cell line that is used in the cytotoxicity testing. However, aluminum does not have a high level of toxicity for the route of administration for that product. You should identify the reason why your product is cytotoxic and then provide an explanation why the device is no toxic for the intended use and duration of contact. This would normally be part of that BEP mentioned above. 4. Which genotox tests are state of the art for the FDA? There are three ways to determine that. One is to look in the recognized standards database on the FDA website. Second is to review the FDA guidance on biocompatibility and application of ISO 10993-1. Finally, you can ask the FDA about the suitability of another test you want to perform during a pre-sub. If they prefer a different test, they will say so in an email response and they are available for discussion by conference call during the pre-sub meeting to clarify their response. Note: I did not answer this question outright, because biocompatibility testing (and all verification testing) requirements change over time. In fact, for one 510k project I had 7 different standards change just prior to submission. During a pre-submission meeting, the FDA should make you aware of coming changes to these tests. Also, the better biocompatibility testing labs, such as Nelson Labs, are also aware of the changes before they are implemented. This is because personnel like Thor Rollins personally get involved in the revision of standards. 5. Will the meeting be recorded since I live in Germany? In addition to the 1-day seminar by Thor Rollins on biocompatibility testing (March 20), we are also offering a 2-day 510k workshop at the same Embassy Suites Hotel in Las Vegas. The cost is $995 (discount for multiple attendees). Here’s the link for registration–or email rob@13485cert.com and I can invoice your company. This article identifies strategic implications of the FDA user fee increase for FY 2018 that was published by the FDA last week. You didn’t know the FDA user fee increased? In August, the FDA publishes the new FDA user fee schedule for the next fiscal year, which begins on October 1. Last year the FDA published an updated small business guidance document in early August that included the fee schedule. This year, the release of the FY 2018 FDA user fee schedule was delayed until the end of August, because the re-authorization of user fees was not approved until August 18, 2017. The MDUFA IV user fee schedule was negotiated in October of 2016, and the new user fee schedule proposed to increase the user fees to $999.5 million. That negotiated plan called for an increase in standard fees for 510k submissions while keeping small business fees lower. The final enacted MDUFA IV user fees follows this plan. There is a significant difference between PMA fees and 510k fees in the new fee schedule. There was a 33% increase for all PMA-related standard and small business fees. However, standard 510k fees increased by 125%, while small business fees for a 510k increased by 13%. The establishment registration fees increased by 37%, and there is still no discounted registration fee for small businesses. Finally, the biggest change is there will now be a fee for De Novo applications. Unfortunately, the agreed FDA user fee for De Novo applications in MDUFA IV for FY 2018 are $93,229 as a standard fee and $23,307 for small businesses. During the past 5 years, during MDUFA III, companies that felt they had a potential De Novo application would try to persuade the FDA that a borderline 510k submission should be a De Novo application instead. However, under MDUFA IV you will be more likely to persuade the FDA that a borderline classification should be considered for a 510k submission instead of a De Novo application. In addition, you should plan your De Novo application more carefully than you might have for a free application. Pre-submission meeting requests should always be submitted during the development process, and these pre-sub requests should be submitted at least 90 days prior to your design freeze. Special consideration should also be devoted to risk analysis and gathering preliminary data to demonstrate the effectiveness of the risk controls you select to ensure that the clinical benefits of your device outweigh the residual risks of the device after implementing risk controls. Ideally, you will gather enough evidence to create a draft special controls guidance document to submit to the FDA as a supplement to your pre-submission meeting. If you are planning a De Novo application for FY 2018, you should expect your FDA reviewer to pay special attention to ensuring that there are no unnecessary delays in the review process. You should also monitor the FDA recent final guidance webpage for release of a final guidance document for De Novo applications. The draft guidance was released on August 14, 2014. Creating a final guidance will probably be priority for FY 2018. The standard FDA user fee for a 510k increased 125% from $4,690 to $10,566. However, the absolute dollar amount of a 510k submission is still less than cost of biocompatibility testing or sterilization validation. Therefore, the increase should not significantly decrease the number of submissions. However, the small business fee has only been increased by 13%. Therefore, if you are a small business (i.e., income < $100 million), you should complete an application for small business qualification as soon as you can (i.e., October 1, 2017) to make sure that you are eligible for the discounted fee when you submit your next 510k submission. If you need help preparing your small business qualification form, there will be a webinar on this topic Friday, September 8, 2017. When you are planning a 510k submission, you should also determine if your device product classification is eligible for third party review. In the past, the increased cost of the third party review made submission of a 510k to a third party reviewer unattractive. However, the fees for third party reviews range from $9,000 to $12,000 typically. Therefore, its possible that there may be no difference in the fee for a third party review unless your company is a qualified small business. The increase in the annual establishment registration fee is 37% for medical device firms to $4,624. If you are already registered as a medical device firm, you should increase your annual budget for the establishment registration fee accordingly. If you are about to launch a new product, remember that you are required to register and list your product within 30 days of distribution of your product. Therefore, if shipments are going to begin in September, you don’t need to register until October (i.e., after the start of the new fiscal year). Therefore, you may be able to avoid paying the FY 2017 establishment registration and only pay the FY 2018 establishment registration. This would not be the case for foreign firms that need to import the product prior to distribution. You may not be able to change the user fee schedule for FY 2018, but there are three things you can do now to improve your situation. First, if you are a small business, you can speak to your accounting department and get them to provide a copy of the FY 2016 tax return so that you can complete the small business qualification form on October 1. Second, you should contact Regulatory Technology Services and the Third Party Review Group to obtain a quote for a third party review of your 510k submission instead of submitting directly to the FDA. Third, you should add a reminder to your calendar for August 1, 2018 to start reviewing the FDA website and other sources for a FY 2019 FDA user fee schedule. If you have not completed a small business qualification form before, you can learn how to prepare your application for small business qualification by registering for my webinar on Friday, September 8, 2017. This article compares the risk management requirements for a 510k submission with the risk management requirements for your design history file (DHF). Last week I presented a free webinar on how to combine risk management with design controls, when planning to submit a 510k. There were many questions asking what the design control and risk management requirements are for a 510k. What are the Design Control Requirements in a 510k? There is no specific part of the the regulations stating what the 510k design control requirements are. However, certain elements of the DHF are required as 510k design control documentation, but not necessarily in the exact form as maintained in the DHF. For example, Design Inputs and Design Outputs are presented as applicable recognized standards and design specifications, while others will remain exactly the same (i.e., verification and validation test reports). What are the Risk Management Requirements in a 510k? For 510k submissions, the only risk management requirements are the inclusion of risk documentation for devices containing software of at least moderate level risk. There are some exceptions to this as well though, based on a few special control guidance documents—especially when the submission type is an abbreviated 510k. This is article identifies which of the DHF and RMF elements are 510k design control requirements and 510k risk management requirements. a) Establish and maintain procedures to control design of device. b) Design and Development Planning – Each manufacturer shall establish a plan that describes the design and development activities, and defines responsibilities for implementation. c) Design Inputs – Manufacturers need to ensure design requirements relating to a device are appropriate and address the intended use of the device. d) Design Outputs – Design outputs need to be documented in terms that allow an adequate evaluation of conformance to design input requirements. Design outputs that are essential for the proper functioning of the device should be identified. e) Design Review – Formal documented reviews of design results should be planned and conducted at appropriate stages of device development. f) Design Verification – Design verification confirms that the design output meets the design inputs requirements. g) Design Validation – Design validation shall be performed under defined operating conditions on initial production units or their equivalents, and shall ensure that devices conform to defined user needs and meet the intended use of the device. h) Design Transfer – Design transfer documentation shall ensure that the device design is correctly translated into production specifications. i) Design Changes – changes should be identified, documented, validated/verified, reviewed and approved before their implementation. The Design History File is intended to be a repository of the records required to demonstrate compliance with your design plan and design control procedures. While companies are required to create, and maintain this documentation according to the FDA regulation, not all of the documentation will be reviewed as part of the 510k. The following table compares the elements that comprise a DHF with the 510k design control requirements. The Device Description lists the specifications of the device, and your Design Outputs document will help populate the Device Description. This can include drawings, pictures, or written specifications that describe your device. The labeling is usually considered part of the Design Outputs within the DHF, and is included specifically in the labeling section of the 510(k) submission. This includes both the Instructions for Use and any Package Labeling. You do not have to include the protocols, but the reviewer may ask to see them if they have any questions when reviewing the reports. Of course, not all of these sections will be applicable for every device, but you should include all relevant validation test reports within your submission in the appropriate section of the 510k. Typically, each of these sections will have a cover sheet that outlines the reports that are included within the section, and then you can just include the report from the DHF in its entirety behind the cover sheet in that section. Regulatory Approval Will result from 510k Clearance, so nothing to be included in 510k submission. For the purposes of FDA compliance and CE Marking, both recognize ISO 14971 as the standard for risk management. FDA recognizes ISO 14971:2007 whereas EN ISO 14971:2012 is the European National version for CE Marking. Rob Packard wrote an article describing the contents of the risk management file as well as the specific differences in the requirements between the FDA and CE Marking with regard to ISO 14971. For the purposes of your 510k submission, the FDA only requires risk management documentation to be included if the product contains software and the risk is at least a level of “moderate concern”. There are some other cases when risk management is required by special controls guidance documents, but even when it is required you only have to submit your risk analysis. The table below describes the risk management requirements in greater detail. Hazard Identification is only required for devices that have a software component. It is not required for most other devices. The Risk Assessment is only required to be included if your device contains software, or if a special controls guidance document specifically requires risk assessment. It is not required for other 510ks. This will not be any additional or special documentation specific to Risk Management, and was already included in the DHF breakdown above, but the verification and validation also relate back to risk management in ensuring that the risks have been adequately mitigated. Risk Benefit analyses are only required for De Novo applications, Humanitarian Device Exemptions and PMAs. Part of the risk management will appear in the Labeling section of the 510k as warnings, contraindications, and precautions within the Instructions for Use and Package Labeling. The special controls guidance will also identify risks to health that have been identified for products of that type, which you should be sure to include in your risk analysis as appropriate. If you need any further information or specific assistance with your 510k submission, please feel free to send me an email at mary@fdaecopy.com or schedule a call with our principal consultant, Rob Packard who can answer any of your medical device regulatory questions. Redacted 510k Database – Have you used the newest FDA tool? This article describes the new database of redacted 510k submissions that was recently made available on-line for immediate download by the US FDA. Recently the FDA made redacted 510k submissions that were previously released through Freedom of Information Act (FOIA) requests available on-line for immediate download. There are 496 redacted 510k submissions available since November 2000–as indicated by the graph above. This is only a small fraction of the total number of 510k submissions, but the number that are available on-line will increase over time. Of the 496 submissions there is a mixture of submission types. This is extremely valuable information that can be used to help select a potential predicate and to develop a verification and validation testing plan. If you are less experienced in the preparation of a 510k submission it will help to see how other regulatory experts have organized their own 510k submissions. In order to access this database, click on this link: Redacted FOIA 510k Database. In order to limit your search to only 510k submissions that are available as a redacted full 510k, just click on the box for “Redacted FOIA 510k.” If you are interested in learning more about how to make the most of this new resource, please sign up for my new webinar on Monday, November 21 @ 9am EST. Abbreviated 510k or Traditional 510k, which should you choose? This article briefly explains the three types of 510k submissions and identifies when you should be submitting an abbreviated 510k instead of a traditional 510k. The first type is a special 510k submission. The FDA target timeline for a special 510k is 30 days, but you can only submit a Special 510k for a modification of your own device that already has a 510k issued. In addition, a Special 510k is only possible if the device modification requires a single technical discipline to review the change. For example, changes to software and materials requires a review of software validation and biocompatibility. Therefore, two reviewer specialists must coordinate their efforts and the review cannot be completed in 30 days. In this case an abbreviated or traditional 510k must be submitted instead. The second type of 510k submission is an abbreviated 510k. The FDA target timeline for review is 60 days. If there is a recognized standard specific to the type of device you are submitting, or the FDA has issued a guidance document addressing that device classification, then an abbreviated 510k submission is recommended. For example, a dental handpiece (i.e., product code is ) has a special controls guidance document that written specifically for dental handpieces and the guidance states that an abbreviated 510k submission is recommended. In addition, the FDA recognizes the latest standard for dental handpieces: ISO 14457:2012 (FDA Doc # 4-206). The third type of 510k submission is a traditional 510k submission. The FDA target timeline for review is 90 days. If you are submitting a 510k for a new device, or the device modifications require more than one functional area of expertise, then a special 510k is not an option. 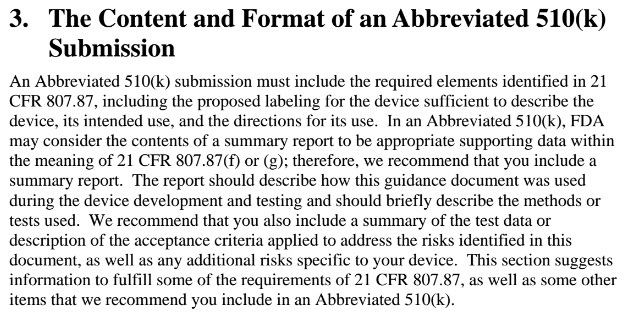 If there is no recognized standard for the device type and the FDA has not issued a special controls guidance for your device classification, then an abbreviated submission is also not an option. A traditional 510k submission is your only option in this case. How frequently is an abbreviated 510k submission type used? In general, I think it requires a little more effort to write clear and concise summaries for the various sections of an abbreviated 510k than it does for a traditional 510k. But if you can get your product to market a month quicker then it’s worth it.